I then opened up the Trusted Root Certification Authorities store on a Windows laptop I have and started looking at several of the root CAs. It turns out that a lot of them have the same or very similar EKU values. I understand why CRL and OCSP are present (even though I would imagine the root would be kept offline which would make OCSP a bit more difficult), but why the others? Does this mean that the CA, in addition to issuing certificates, can also sign code, perform S/MIME functionality, etc.? Or does the presence of these values mean that certificates that descend from this root CA can only be used for, at most, those EKU values? In general, this extension will appear only in end entity certificates. Does placing these EKU values in the root CA cert indicate that the end-entity certificates descending from that root can have, at most, those EKU values? If no to 1, why are these values present in multiple root CAs? Is it so these CAs can also be used for those purposes? If so, why would one want to do that instead of issuing an end-entity certificate with those EKUs? 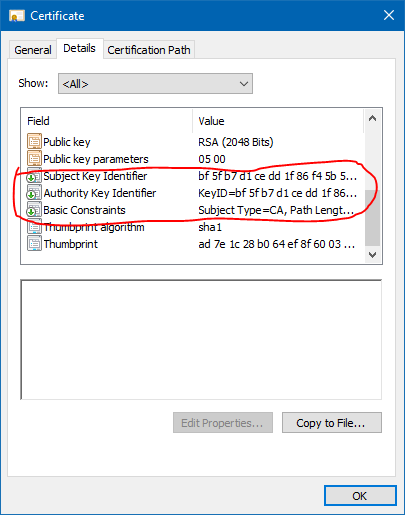 The reason you see that ExtendedKeyUsage list is simply down to the application used by the website linked in your question to dump the textual representation of the certificate. If you look at the page again you will see a Base-64 encoded representation of the certificate. Copy and paste it into a file and save it. Dump the textual representation of the certificate with OpenSSL and you'll simply see the following. Note: If you are running Windows, save it with a .cer or .crt extension and double-click on it. 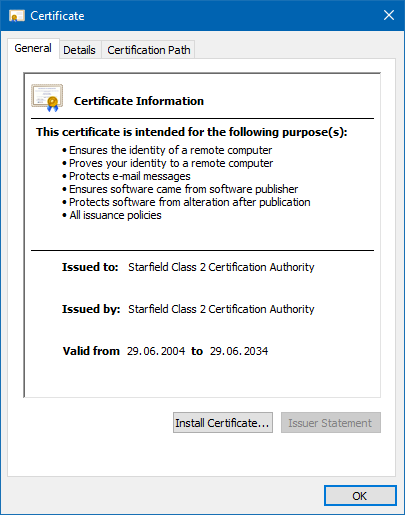 Windows will display the certificate in a GUI, showing similar information. A root CA certificate shouldn't really contain any extensions (other than optionally SubjectKeyUsage and AuthorityKeyUsage used to help chain building) as it limits what the certificate can be used for during the whole of its long lifetime. Such limitations should be added at the subordinate CA level. As you stated in your question, the ExtendedKeyUsage is for the particular certificate, not for the chain (unlike policy and name constraints). this is correct. The valid EKU for particular certificate is (roughly) the intersection of the EKU extension restrictions in the full cert chain. So if a CA cert has an EKU extension containing OID1 and OID2, it cannot issue certs that are valid for any other EKU OID. However, this is not strict rule, it depends on a client application that performs certificate validation. 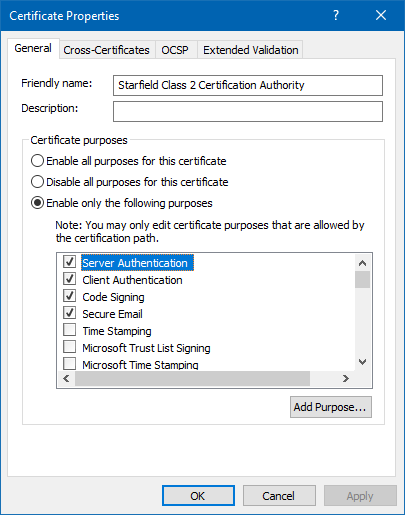 For example, in order to validate OCSP Signing certificate, it is enough to have OCSP Signing (1.3.6.1.5.5.7.3.9) only in leaf (signing) certificate. Entire chain is not required to be valid for OCSP Signing usage. If the issued cert contains another EKU OID and client application asks if the certificate is valid for specified usage, certificate chaining engine will not consider the cert valid for that OID. statement above is not part of RFC. In fact, RFC does not restrict CA on issuing EKU. Like I said, EKU validation through the chain is application-specific. If application requests EKU validation through the chain and EKU is not allowed in every CA certificate in the path, validation will fail. If application requires specific EKU only in leaf certificate and specified EKU is presented, validation will succeed.